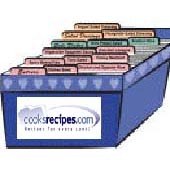 This recipe for Bulldog Banana Bites was submitted by Diana Hatfield-Bixby. Knead for 2 minutes on a floured surface. Roll to 1/4-inch thickness. Use a 2 1/2-inch bone-shaped cookie cutter (or any one you prefer) and place on ungreased baking sheets. Bake at 300°F (150°C) for 30 minutes. Cool on wire rack. Note: Original recipe by Betsey Roberts of Florida, proud momma of 3 bulldogs.